Like some 45,000 passengers, my family took the Green Line yesterday. Since there were 5 of us, we made up collectively 1/9000 of all trips. Since we went both ways, and assume everyone else did too, we were in fact 1/4500 of all passengers (sounds a lot less impressive). My Flickr set is here. 1. We went to Westgate station and boarded the second eastbound trip of the morning, headed for Union Station. The train was pretty much in crush mode, standing room only. All of the passengers seemed to go all the way to Union Depot. I assume this is just because it is opening day. The Capitol stop was empty. 2. 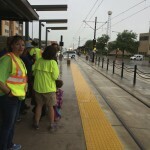 The Westgate station platform wasn’t particularly crowded, there were probably more staff and volunteers and Metro Transit Police than Passengers. Eagerly awaiting the train, if only it wouldn’t get stopped at a red light just before the station. When will it come? Please check Schedules! 3. Please Check Schedules. The Variable Message Sign which is supposed to say when the next train is coming STILL doesn’t work, even on the new system. I don’t know what the problem is, but this is embarrassing. 4. Based on this and other rides, my youngest son is moderately allergic (skin hives) to the material in the seats. I don’t know what chemical is used. I don’t know if he is the only one. He will be wearing long pants for any future rides. 5. Ran into streets.mn writer Tony Desnick on the train. So I suspect it is not 45,000 passengers, rather it is 22,500 transportation and planning geeks and their friends and family who made round trips on the train. 6. It was raining and windy, so many of the festivities were cancelled. Union Depot was mobbed, so it is good to have a backup indoor facility not otherwise being used. 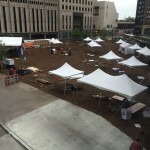 Planned festivities sadly derailed due to weather. 7. Our plan was to go to the Science Museum, which we did. The St. Paul Skyway is terribly inefficient for this trip (and to their shame, the Pioneer Press closed their building’s section when it should have been open), but at least it was dry. There was a miniature golf campaign along the enclosed path, but business seemed low. A cookie vendor packed up and just left packages of (nice) cookies for the taking. 8. Going back to Minneapolis, we boarded at St. Paul Central Station (which seemed like it would be less crowded, and was slightly closer than Union Depot) and just before Robert Street Station got to see an automobile on the tracks. This did not seem to result in any cancelled trips, but instead I am guessing single-track operation for a bit. The adaptability is good. This however is a warning to streetcar designers about curb-running tracks, where switching will be much more difficult if not impossible to avoid blockages. (The fault is not in ourselves, but in our cars). 9. Buses seemed to be more frequent and faster than the train on University. I assume the more frequent will go away (with fewer (I assume no) “Green Line” buses), but faster surprised me. 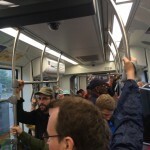 Standing Room Only on the Green Line Opening Day. 10. The traffic signals are not optimized for LRT. It is especially annoying when there is a red light just before the station. I believe it is within the capacity of engineers to design traffic signals that will give higher priority to LRT than to cars, so that the train only stops at stations. The lack of coordination between the agencies (or lack of direction to the engineers) is a policy failure. I assume it will be tuned. On the other hand, what were the last 6 months of test runs and 4 years of construction for? 11. Snelling at University in particular really should have been grade separated. Think Dupont Circle in DC for a model. 12. Connections are important, and connecting Minneapolis and St. Paul is of course valuable. 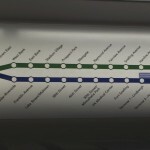 But for politicians to say this now connects the cities of course ignores the previously existing transit between the cities carrying the majority of passengers who will be using the Green Line. Yet more dissin’ the bus. But I am sure it will carry more people than the bus, mostly because of the higher frequency, but in part because some people are too good to ride the bus, and are now being catered to. Car on tracks near Robert Street Station. 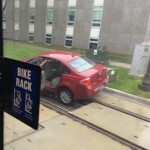 Don’t drive on tracks … This is not a Streetcar. 13. The ride was very smooth, and not too herky-jerky despite all the stops (stations plus red lights). Still standees need to hold onto something. 14. There seemed to be some LRT bunching, in that two trains arrived at Union Depot well within the 10 minute headway.